| New York, NY - November 15, 2018 | Interior design and branding firm, MARKZEFF, designed the interiors at Mountain Shadows in Paradise Valley Arizona. Nestled below the Camelback and Mummy Mountains, the resort reopened following a complete rebuild of the 1959 original. The gorgeous views of the mountains served as a point of inspiration for award-winning designer and Principal of his eponymous firm, Mark Zeff, who captured the picturesque scenery with expansive windows that allow the environment’s brightness to light the clean, open interiors. The space has a bold, indefinable energy underscored by its history and designer Mark Zeff's focus on black and white, influenced by a personal affinity for the halcyon days of the '60’s. The color, materials and design aspects of the space therefore emulate a play between dark and light, further enhanced by the shadows of the iconic mountain silhouettes that stretch across the valley. "Growing up in South Africa, I spent a lot of time in nature. I used to stand and appreciate the stretches of wilderness from the hilltops near my home. This project was an opportunity for me to reconnect with nature, and find inspiration in the "paradise" of Paradise Valley," says Mark Zeff. "The mountains gave form to a lot of my creative process, and sparked my idea to keep the interiors simple and modern. That way, one can appreciate the views in a relaxed environment." Zeff's take on a Midcentury look and feel gives a contemporary touch, with a refined restraint that balances simplicity and comfort. The two story building is low to the ground with a rambling landscape featuring a large pool and expansive golf course. Mountain Shadows also features a restaurant designed by Zeff, Hearth ’61. Operated by renowned Chef Charles Wiley, it serves seasonal American fare made with local and organic ingredients for a simple sophistication that mirrors Zeff's interiors. MARKZEFF is an interdisciplinary architecture and design firm founded in 1985 by owner Mark Zeff. A detail-oriented approach results in the company’s original and distinctive environments that have both elegance and style. The award-winning company is based in Dumbo, Brooklyn, and specializes in a broad range of work from luxury residential, hospitality, and retail to high-end real estate development. The firm seamlessly integrates high quality craftsmanship, handmade items, custom furniture, lighting, and hardware with the latest technology, earning the company a reputation for delivering cutting edge design. 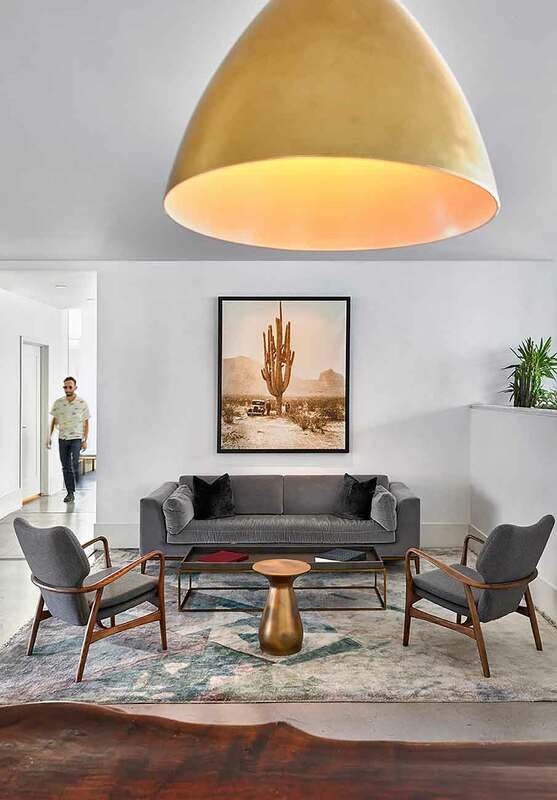 MARKZEFF has an extraordinary presence, nationally and internationally: past projects range from infusing Hotel Van Zandt in Austin, Texas with an innovative “elegant cowboy grunge” to conceiving the Hilton Worldwide’s new global lifestyle brand, Canopy. Residential projects include designing homes for clients like Hilary Swank, Annie Leibovitz, Alexis Bittar, and Gabriel Byrne.